The Australian government, for its part, committed to support the peace process in Mindanao and announced it would contribute 40 million Australian dollars or P1.54 billion over the next six years for various projects in the area. In return, Abella said Duterte expressed the country’s interest to learn responsible mining from Australia given its experience and expertise. 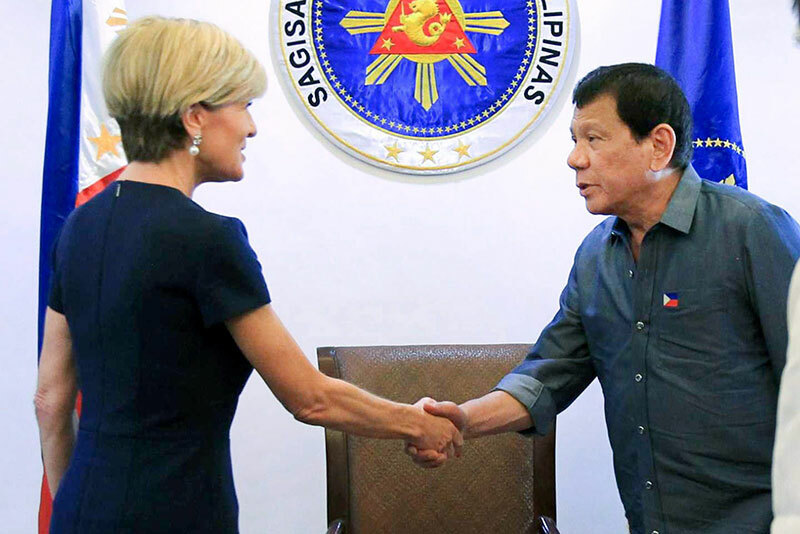 Bishop assured Duterte that Australia is willing to cooperate in building capacities for responsible mining and use of energy resources. “It was a very warm and cordial meeting which reaffirmed the long-standing ties between (the Philippines and Australia),” Abella said. “It sets the tone for a more positive engagement between the two countries as strategic partners,” he added. 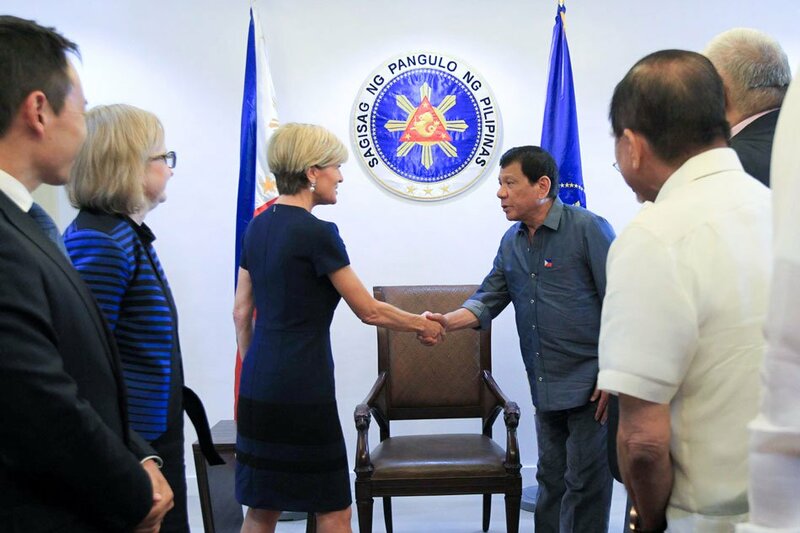 Bishop said Australia would also provide 90 million Australian dollars (P3.4 billion) over nine years to support conflict-sensitive quality basic education services in the Autonomous Region in Muslim Mindanao through a program called Education Pathways to Peace in Mindanao (PATHWAYS). "Today I announce that the Australian Government will provide assistance to ease civilian suffering caused by the siege in the Philippine city of Marawi and contribute to peace-building in the area. "The Australian Government is providing $20 million over four years to support recovery and long term peace and stability in the southern Philippines. This is in addition to the emergency food and other supplies valued at $920,000 that I announced on 20 June 2017. "Yesterday I met with Philippines President Rodrigo Duterte in Manila, our second meeting for 2017. We discussed the conflict in Marawi and the impact it is having on civilians in the region. "The siege has brought enormous distress to the population of Marawi with around 360,000 people forced to flee their homes. Australia’s support will help meet the urgent needs of these displaced people including through child protection and counselling services. 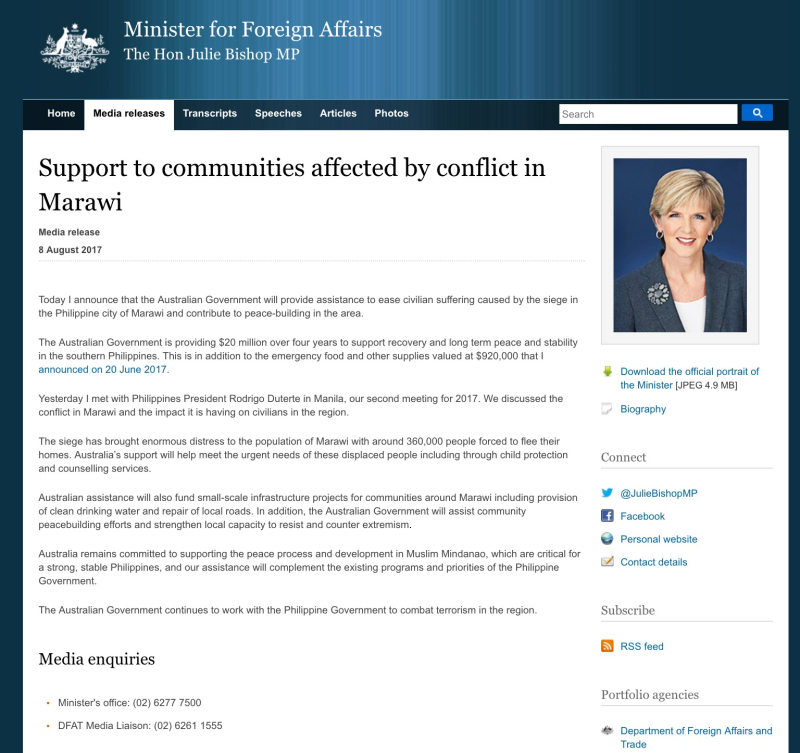 "Australian assistance will also fund small-scale infrastructure projects for communities around Marawi including provision of clean drinking water and repair of local roads. In addition, the Australian Government will assist community peacebuilding efforts and strengthen local capacity to resist and counter extremism. 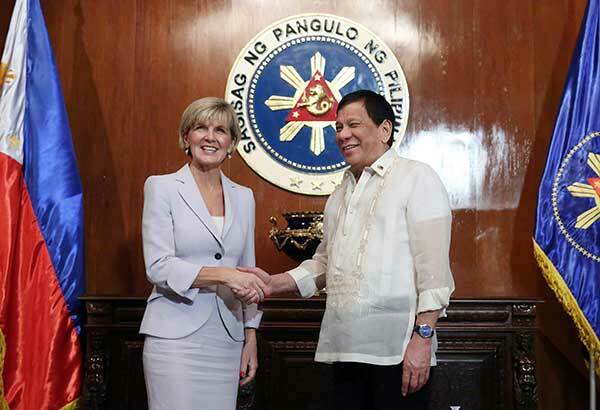 "Australia remains committed to supporting the peace process and development in Muslim Mindanao, which are critical for a strong, stable Philippines, and our assistance will complement the existing programs and priorities of the Philippine Government. "The Australian Government continues to work with the Philippine Government to combat terrorism in the region. Thank you Mdam Bishop and ro your country for extending help to our country. God bkess you and oir country. Madam Julie Bishop and to all australian people thank you very much to helping the marawi city, god bless you. Dont thank the government thank the hard working taxpayers of Australia. Our country is billions and billions of dollars in debt, gas and electric prices going through the roof, young people cant afford to get into there own home, we exprot gas to other countries and pay huge price for our own. AND yet we can afford to hand out 140 million dollars . Over five years. When they give our pensioners a par rise its not eneough to buy a coffee and a bun. But i guess their need isgreater than ours,.